In 1998, Lauryn Hill was arguably the most explosively popular artist on the planet. And then, just like that, she became one of music's most elusive and mysterious performers. 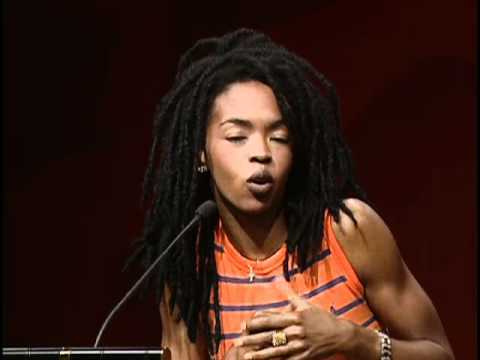 The New Jersey signer/rapper began her career with The Fugees and, after their break up, exploded onto the charts with her groundbreaking solo debut The Miseducation Of Lauryn Hill. The album cemented Hill's legacy as a brilliant songwriter and producer as well as an incredible singer, but it also led to a dark period that included something of a mental breakdown. Hill's career has been a rollercoaster of personal drama, public meltdowns, incredible songs, prison time and one timeless album. Let's take a look at some things you might not know about the incomparable Lauryn Hill. In 2003, Hill performed at the Vatican in Italy for a Christmas benefit concert, and used the opportunity to speak up about injustices and corruption within the Catholic Church. "I want to ask you, what have you got to say about the lives you have broken? What about the families who were expecting God and instead were cheated by the Devil?" she said during her performance. "Who feels sorry for them, the men, women and children damaged psychologically, emotionally and mentally by the sexual perversions and abuse carried out by the people they believed in?" The Catholic League later responded, calling Hill "pathologically miserable" and said her career was "in decline." Lauryn Hill and Rohan Marley have a lengthy history together, which includes five children and a relationship full of drama. The couple was together for a decade until splitting in 2011 on mysterious terms. Both have remained relatively vague about their relationship, though Marley said in an interview with Open magazine that their demise was due to him not properly expressing his love for her. “I feel sad that I loved her so much and I faltered in expressing it to her somehow. It was my fault that she did not understand how I felt, and it was sad that we did not work out in that relationship sense. I was heartbroken for a long time,” he explained. Things got even more interesting following their breakup, when Hill gave birth to her sixth child around the same time as the couple's split. Rumors swirled that Marley broke up with Hill in order to date Brazilian model Isabeli Fontana, which he firmly denied. In 2011, Hill was outed as something of a diva when her management team demanded that staffers with the Sundance Film Festival, where she was performing, address her only as "Ms. Hill." "Everyone sort of rolled their eyes and chuckled but promised to oblige," a source said of the demand, according to reports. Although her demands were criticized, the two-hour performance was praised by those in attendance. "She put on the best show I've seen in six years," said Konstantine Deslis of 50 Harry O's, the company who put on the show. I never told anyone not to look me in the eye, that may have been something someone said assuming what I wanted... And yes, ‘Ms. Hill’ was absolutely a requirement. I was young, Black and female. Not everyone can work for and give the appropriate respect to a person in that package and in charge. It was important. Hill's debut solo album, The Miseducation Of Lauryn Hill, was a massive success and would go to win five Grammy Awards and sell 19 million copies worldwide. After that, things began to get a bit strange for the performer. She followed the album with 2002's MTV Unplugged No. 2.0, which was recorded in front of a live audience and featured Hill performing entirely new songs with just an acoustic guitar. The recording was seen as the beginning of a nervous breakdown for Hill, which led to seclusion and odd behavior for several years. The album was full of not just underwhelmingly simple songs, but also a number of spoken word tracks that didn't quite go over well with fans or critics. One review in The Guardian said it best, joking that "you can hear executives from Hill's record company wailing impotently and tearing clumps of their hair out" in the background during her multiple rants.